Hello Guys, Today I won't be sharing any Blogging Tips or any Technology Update. I'm not even going to make a Tutorial guide or anything else. As the Title says, Today I'm going to post a small conversation with a pro blogger Paul Crowe. 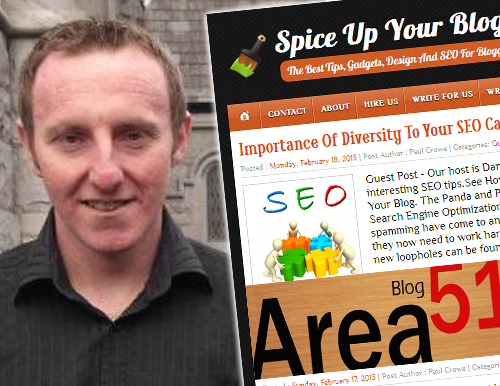 Paul Crowe is a professional blogger and the founder of very popular Spice Up Your Blog, which is one of the most visited blogging tips and blogger widgets blog. Recently I asked Paul for an Interview and in reply got a quick yes. I was very happy and excited, The Interview went very well and I learned many things from Paul's experience. Today I'm publishing that Interview so that every blogger can take advantage of Paul's knowledge & experience. So here we go. Jim: Hello Paul and Welcome to Area51 Blog, Can you Please tell us something about yourself? Jim: When and How you Started Blogging? What inspired you? Paul: I started my first blog in 2006, it was kind of a personal blog with a focus on sport. It was when designing this blog I got the idea to create a blog tips site and that's were Spice Up Your Blog came from. Jim: Tell us something about your Blog and Target audience? Paul: The blog is a collection of posts designed to help bloggers of all levels so our target audience is people with their own blogs that are looking to improve and grow. Jim: What according to you played an important role in SpiceUpYourBlog's Success? Paul: There are a number of things, it was one of the first blog tips sites, there was of course hundreds at the time but now there are thousands.Also for the first year I had no ads on the site as it was not something I was looking to make money from, so the focus was only on helping fellow bloggers. So many new blogs now have more ads than content. Paul: At the moment we get about 250,000 pageviews per month with around 110,000 uniques. Jim: How is your Life when you're Offline? Are you treated differently as a 'Blogger'? Paul: To be honest one thing I like about it is very few people offline know I'm a blogger. My friends don't really have an interest in blogging so it's not something we talk about much. Jim: Apart from Blogging, What are your Interests? Paul: I love sports, film and TV. I also have an ever growing interest in science especially physics. Jim: Your Favorite Bloggers? What Blogs you visit regularly? Paul: I guess it's obvious I would like tech blogs but I also follow some science blogs. Even though it has gone very broad and takes for ever to load I never go a day without checking Mashable. Jim: Apart from SpiceUpYourBlog, How many other blogs you have? How many hours you spend working on your blogs per day? Paul: I have about 15 websites and blogs although some are just static so they don't have to be updated. I would probably spend between six and eight hours daily online. Jim: What are your future plans? Paul: I don't really have plans to branch out or start new projects so I am focused on growing Spice Up Your Blog and the other sites. Jim: What are the major sources of your online income? How much was your first online income? Paul: On SUYB and the other blogs it's ad sales from AdSense and BuySellAds along with custom design work. I have other sites that earn from affiliate marketing. My first online income came from AdSense, it was 70 euro ($100) and it took about 5 months to earn. Jim: What is the Importance of Google PageRank and Alexa Rank in your Blogging life? Any Tips for beginners? Paul: They are important indicators but I think some people pay too much attention to them.You need to remember Alexa collect their information only from people using their toolbar.So you could have huge page view count but if they do not have the Alexa tool bar installed they wont be counted.So make sure to install the tool bar your self. For page rank I think guest posting is a great way to get good links to your blog. 10 Killer Tips to Improve Your Blogs Alexa Rank. 10 Simple Tips to Improve Your Blogs Page Rank. Jim: What are your views on Google Panda / Penguin Algorithms? Any Tips? Jim: Is there anything you would like to share, Which you think if you would have known earlier then you might have been somewhere else? Paul: Just the same old boring advice to be patient as patience is everything when trying to grow a blog. Jim: Blogger or WordPress? What you prefer and Why? Paul: I'm between both when it comes to this, a year ago it would have been Wordpress but Blogger have made some great changes in the last 12-18 months. Spice Up Your Blog is hosted on Blogger and I have not seen any reason to change it however the latest site I started is on Wordpress as I needed the site to be run on php. Jim: Your Top Favorite Blogger / WordPress widgets? Paul: If I was to give one for each I would have to go for the scrolling share bar on blogger (http://www.spiceupyourblog.com/2012/05/jquery-scroll-bar-social-bookmark.html), It really did make a huge difference in the number of times posts were shared. On WorePress I think the Yoast SEO plugin is great (http://yoast.com/wordpress/seo/). Jim: Your Favorite Movies / Music / Location / Sports / Gadgets? Jim: What Tips you would like to give to New Bloggers? Paul: Get a fresh design, lots of original content and no ads until you have built a strong following. As with question 14 patience is a virtue. Jim: What Do you think about The-Area51.com? Any Suggestions you would like to give so that we can improve our site? Paul: I think you are doing a good job just remember to be as original as possible, you need to stand out from the thousands of blogs in the same niche. Jim: Thank you very much Paul for being with us, We were happy to have you. Good Luck for the Future!!! So this was my interview with Paul Crowe, I hope you guys will learn from this and apply it to your blog. Checkout Interviews of Other Bloggers.